Wow! I could have begun this test with a bit of model history, or some techno-babble or a quote. But let's not mess around. The 2004 A6 is fantastic. And so far removed from the old one it shouldn't even be thought of in the same breath. 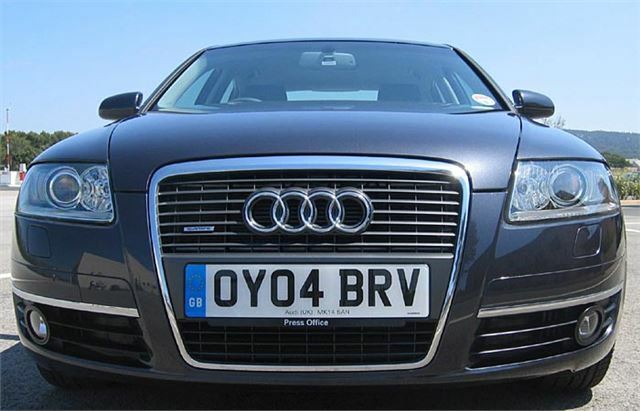 This account covers three models: the 3.0TDI quattro SE 6-speed Tiptronic, the 4.2 petrol quattro SE 6-speed Tiptronic, and the 3.2 FSI petrol front-drive SE 6-speed manual. With fuel prices going crazy again and with 225bhp under the bonnet, the reasonably priced 3.0TDI quattro is the obvious car to start with. It's powerful, refined and comfortable, grips and handles well, has steering wheel paddle shifters for the gears, can do 33mpg combined, and sounds wonderful: like no other diesel car I've ever driven. Volvo 850TDIs with the old straight five VAG 2.5 diesel made nice noises. 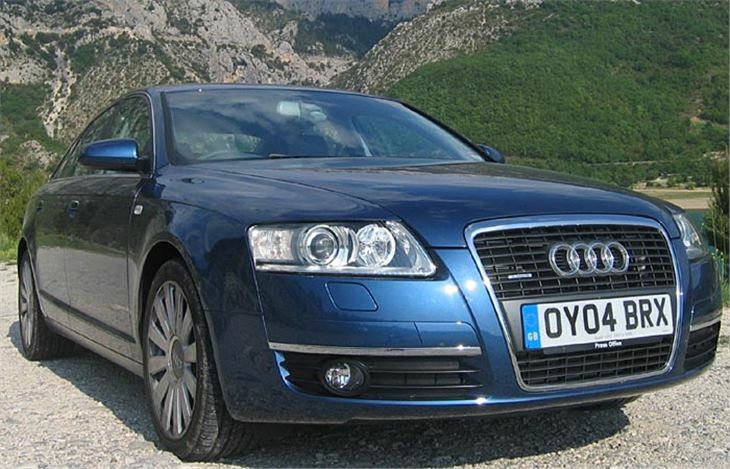 But the 3.0TDI V6 plays you a symphony you never get tired of. Normally it’s quiet. Yet get the hammer down and you hear a gutsy growl that's such a pleasure to listen to you can wreck your fuel economy figures just turning up the volume. The steering is light for parking, yet weights up nicely to give a good feeling of control on the move. The Multi Media Interface information system is intuitive to operate. The paddleshift 6-speed tiptronic autobox works fine. The car is so good we simply thought, "well since this is the car to buy there's no point in even bothering to try any of the others." But duty called. We were hijacked on the road by another crew with a 4.2 who wanted to change cars, so we dutifully swapped. At that point, any vestige of responsibility went out of the one-touch power operated electric windows. 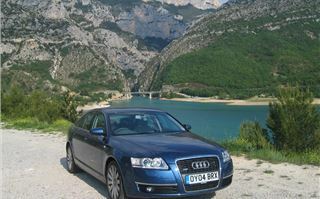 If the 3.0TDI is a brilliant compromise between common sense and driving pleasure, the 4.2 is all pleasure. You must have seen the movie, 'Bullit'? The audience I'm writing to here can't not have done. You remember the noise of Frank's solid-lifter Mustang V8? Well that's exactly how the A6 4.2 sounds when you get the loud pedal down. 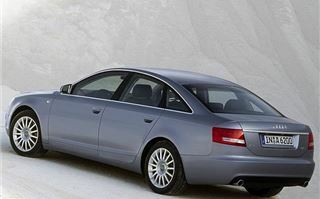 Unlike Frank's Mustang, however, this one revs round the dial very quickly indeed, you have six gears to play with, and you have a Torsen clutched quattro four wheel drive system to keep you on the road a lot more tidily and at much higher speeds than Bullit's gyrating green Ford. It's a hoot to drive. Picks up enormous speed (by which I mean 150mph) in the space a lot of cars are pushed to hit 100. And grips so prodigiously you would need to have had part of your brain removed to get the car and yourself into real trouble. 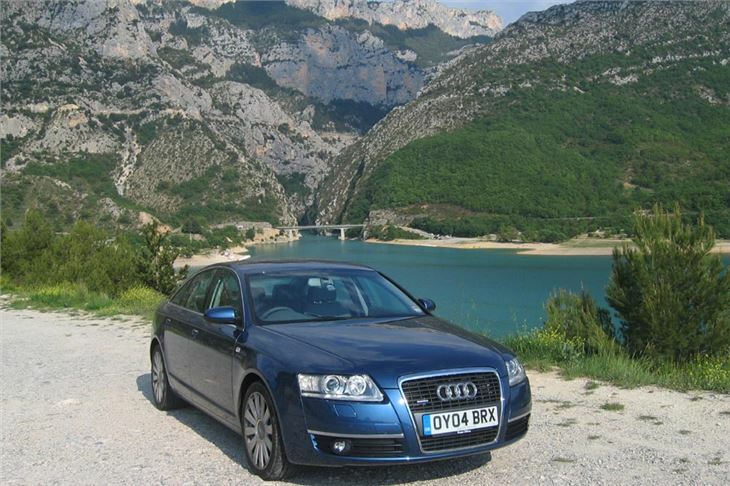 The first two Audi A6s we tested are so good they instantly wiped out the opposition from BMW and Mercedes Benz; something no one would previously have thought possible of an A6. So, finally, on to what is marginally the cheapest of the three: the 250bhp 3.2 FSI 6-speed manual front wheel driver. 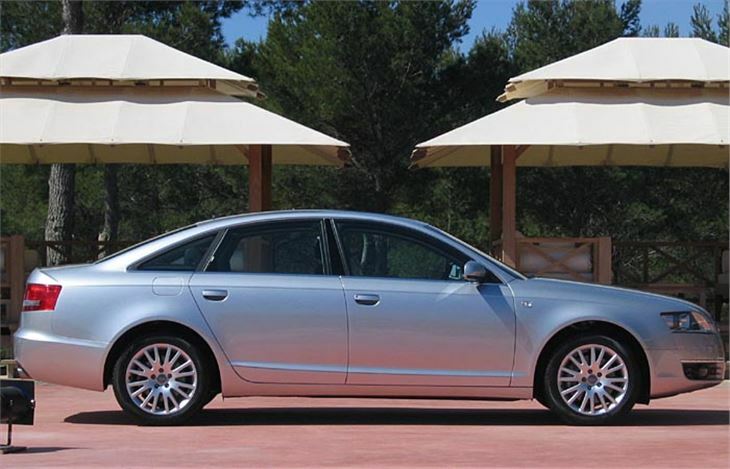 Now terminal front-drive understeer always used to be the A6 order of the day. But they've even turned this one into a sportscar. Sure, at the end of the bend, if you push a bit too hard it's going to go off-roading front-first. 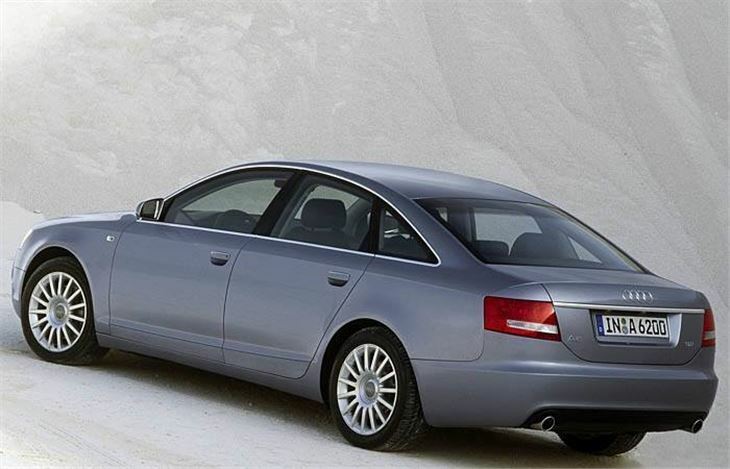 But Audi has somehow managed to contain this characteristic better than ever before. It's nice to drive. It's benign. Body weight saps a lot of the 3.2 V6's low-down torque, so if you want to play boy racer you'll sometimes need second instead of third. But it's a nice car. It pulls gamely. And treats reaching 140mph as matter-of-factly as tootling around town. So three great cars. The drivers amongst us might save a bit of money by going for the slightly more aurally pleasing, sweeter handling BMW E60 525iSE manual. 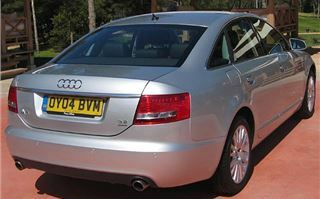 But the lesser A6s are the only cars where the range really has any strong competition. The cars we drove were uniformly excellent. Only one small criticism, which isn't really a criticism at all. They're four seaters, not five seaters. Kids on kids seats will be fine centre-rear, but don’t expect a grown-up to sit there.